That’s right, year two of the indie magazine officially started last week with the release of issue 5. And, while we love all of our little mutant babies, we feel especially proud of this issue. So what will you find inside Issue 5? “After War”: A retelling of the African tale of Yennenga of Burkina Faso by Alison McBain. “Irini”: A princess is caught in the middle of a palace coup, and discovers more about her family than she ever realized. An excellent slipstream fantasy by Aaron Emmel. “Let It All Bleed Out”: a dark piece on small town Americana by J Rohr. What happens when you call out to the darkness, and what might be listening? “Jerold’s Stand”: An honest-to-God medieval ballad dressed up like a fantasy story by David F. Schultz. “Giving Up the Ghost”: A man is stranded alone on an alien planet with nothing but the ghost of his dead wife and some alien lizards for company. But when given the chance to escape, what will he be forced to leave behind? A bittersweet story of forgiveness and regret by Dianne Williams. “Last Train to Oblivion”: Henry wakes up on a train, only he doesn’t remember how he got on board and he doesn’t know where it’s going. I mean, he’s just a simple chiropractor from Ohio, right? A tale of hidden monsters and how promises of paradise might not be all they are cracked up to be, by Tom Howard. 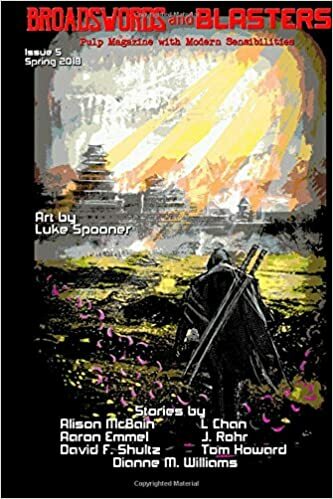 “Petals Falling Like Memories”: A wuxia tale of full of high action and intrigue following Brother Sword as he takes lives and memories. L Chan delivers on the promise of the title, and his story is the inspiration for our cover this issue. Issue 5 is available for POD or Kindle via Amazon. As always, reviews are appreciated and welcome! This entry was posted in Fiction and tagged ballads, broadswords and blasters, fantasy, horror, indie mag, indie publishing, magazine, new pulp, Pulp, sci-fi, short reads, small press, wuxia. Bookmark the permalink. 1 Response to Issue 5 of Broadswords and Blasters Available Now!